Pouro is a new and patented liquor pourer which fits in most liquor and wine bottles. This is the first ever Technology that allows the top to be closed with a simple twist. No more covers, tops or cups required. You just twist the top closed and have confidence that the contents will remain clear of contaminants till the next usage. 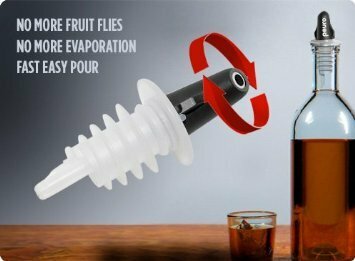 No more fruit flies. No evaporation of spirits. In the open position the pour is smooth and precise. Designed for the right pouring seen based on user feedback. Can also be used for household liquids like olive oils, coffee house syrups and cleaning products. Pouro is dishwasher safe, reusable and BPA free. If you have any questions about this product by Pouro, contact us by completing and submitting the form below. If you are looking for a specif part number, please include it with your message.